St Mary Star of the Sea Catholic Church in West Melbourne has a new chapel, dedicated to the the Madonna del Terzito. Located near the base of theme unfinished tower, the chapel forms part of the church's 150th-year restoration program and has been decorated in the rose colour scheme that was originally chosen for the church's formal opening in 1900. 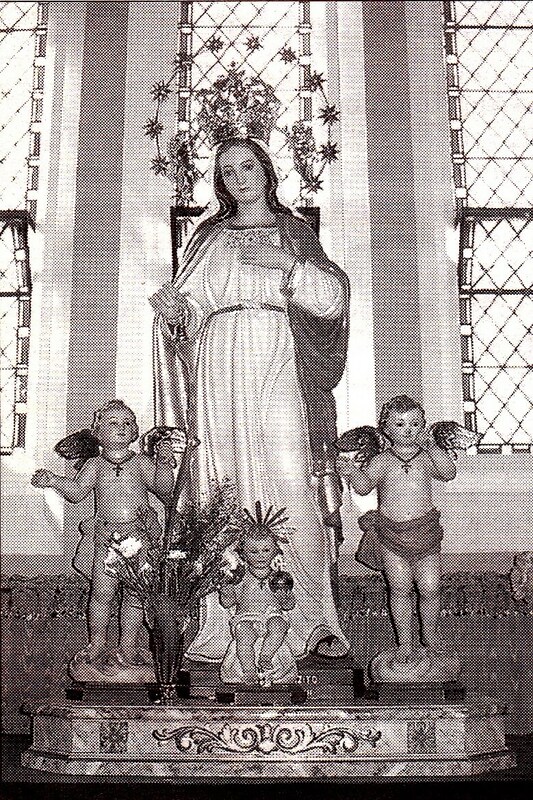 The sculptured Madonna, which is a copy of the venerated Madonna del Terzito in Salina, one of the Aeolian islands north of Sicily, has long held a special place for Aeolian Islanders living here. The islanders migrated to Melbourne in its early days, establishing themselves as market stallholders at the Queen Victoria Market and making St Mary Star of the Sea their centre of worship. Their descendants, who still maintain stalls at the market, continue to use the church as their pastoral centre. They gathered on 20 February to celebrate mass, conducted in a strong Italian accent by His Grace, Monsignor Giovanni Marra, Archbishop of the Aeolian Islands, which include Salina and Lipari. The archbishop then led a procession of clergy from the front of the church to the chapel. A large group of enthusiastic and strong Italian men followed, bearing the Madonna on a platform. There Archbishop Marra dedicated the new chapel and blessed the Madonna. Monsignor Marra, who was born in Cinquefrondi in Reggio di Calabria, is a renowned representative of the Italian Bishops' Conference. As the pastoral representative of the Madonna del Terzito's island home, his presence at the blessing of the chapel had a particular spiritual significance. JILLIAN BALL spoke recently with Tom Hazell, chair of St Mary Star of the Sea's restoration committee, to find out how the works were progressing. The cost of the required restoration works has been assessed at $10 million, to be spent over several years. Most of the work is being funded by donations, and many supporters have been generous with both cash and time. The scaffolding is an in-kind gift from the construction union while the plumbers' union will repair the roof free of charge. Both these unions have their headquarters in the parish, which stretches from North Melbourne to Carlton. The roof will be repaired using slate from the 1900 building. As with many of Melbourne's early public buildings, the material used in the original church was Barrabool sandstone mined west of Geelong. It has not, however, proved to be durable, resulting in the cracking and weathering that we see now in the original church building, much of which is about iso years old. The restoration committee accepted advice that Beaudesert sandstone was the most suitable for repairs. The Beaudesert stone will be dressed on-site in a temporary shed erected on the south side of the church, so that visitors can inspect the work and see the techniques being used. The interior of the church will be repainted in the rose colour recently revealed when the old walls were stripped back. Modern technology will be used to match the colours exactly. The refurbishment of the sanctuary will be a separate and more ambitious project incorporating stencilled decorations that match the originals. This is not planned for the first year of restoration because of its high cost; it will be dependent on income generated from donations. Anyone who wishes to make a donation may contribute to general funds or may nominate a specific project outlined in the restoration schedule. The restoration plans are far-reaching. The committee hopes to restore the front of the church facing Howard Street by mid 2005, following which a special dedication will take place. The front entrance will then be available once more to parishioners. There have been complaints from bridal parties who cannot use the doorway for wedding processions entering and leaving the church. Plans have tentatively been laid for a major undertaking to complete the tower over a 10 -year period. This has not been factored in due to the more urgent restoration and the huge funding requirement for the tower. Migrant groups feature strongly in the history of the church. St Mary's has been Australia's principal church for the Maltese since settlement, and the connection continues as families come back to the church even after dispersing widely. Lithuanian and Irish Catholics have also had a long association with the Star of the Sea. This is one of very few churches in Australia where the mass is celebrated in the Lithuanian language. 20 February . A well-known figure in the historic fabric of the church is Bob Santamaria. Arriving in Melbourne in 1890 from Aeolian island’s, he became outspoken on matters of social consciousness. The controversial Cardinal Mannix was the parish priest at St Mary Star of the Sea in his early ministry. He was elevated to Coadjutor Archbishop in 1913 and in 1917 was appointed Archbishop, leading the Irish nationalist movement whose centre of activities was St Mary's presbytery.